The chapel is set half a mile off the B4521 between Llanvetherine and Cross Ash. The chapel of Llanfair Cilgoed (St Mary at the cell in the woods) was built in 1843 for people who had too far to go to the parish church at Llantilio Crossenny. It replaced a medieval building which had fallen into ruin in the eighteenth century. In December 1844, Mereweather was licensed to the cure of this new chapel. 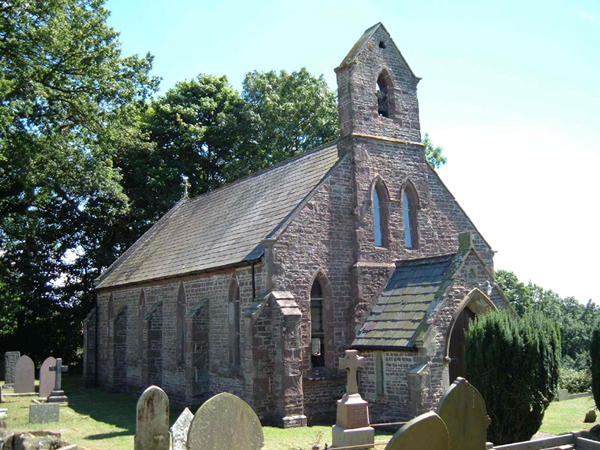 In 1925, the Llanfair chapelry was transferred to the parish of Llangattock Lingoed. Nov. 15th . Received a note from the Dean of Llandaff appointing the 19th for examination. 16th. Received my College testimonials from the Vice with a kind note. 17th. My Si Quis read in the parish of Abergavenny by the Vicar. 18th. Rode to Llandaff in a hired gig accompanied by W. Price. 19th. Was examined by the Dean. Passed with particular facility. Returned to Abergavenny by night. 20th. Having received my Bristol testimonials with two Signatures (Mr Hall and Mr Rogers) countersigned by the Bishop of Gloucester and Bristol, I got the Vicar to add his name. 21st. Sent off my testimonials, to wit, my Baptismal Register, Divinity lecture certificate, Si Quis & 2 Testimonials to the Bishop of Llandaff at Offwell, near Honiton, Devon. 28th. Had an answer from the Bishop acknowledging the receipt of my testimonials. Dec. 8th. Was ordained in the little church of St Faith in St Paul's churchyard [London] at 8 a.m. The rector [Richard Harris Barham], author of Ingoldsby Legends, assisted the Bishop [Edward Copleston]. Returned to the Deanery by 9 and breakfasted with the Bishop. Afterwards attended full service at St Paul's and received the Sacrament. Paid yesterday to Mr Burder £2 15s. for fees. [Jan.] 15th . Did my first service in my church Llanvair. Got through much better than I expected. Had a christening and churching to do after. The snow covered the ground and the cold was intense. Llantilio Crossenny is shown east of Abergavenny on the road to Monmouth. Llanfair chapel is situated further to the north, west of Cross Ash (just north of the Ross road). See below for a large-scale section of the map. Llandaff cathedral stands on the right bank of the Taff, near Cardiff, in Glamorganshire. Bristol is situated across the Bristol Channel, a few miles up the Avon.